Nicolas Bijan, 23, is the son of Pakzad Bijan, the late owner of “the world’s most expensive store,” known as the “House of Bijan.” Born into luxury, he’s already amassed an amazing knowledge of luxury timepieces, and an equally impressive collection. Outside of work, Pakzad was perhaps best known for his impressive auto collection, made up of yellow Rolls-Royce and Bugatti cars. But Nicolas reveals it was his father’s collection of rare Audemars Piguet and Patek Philippe watches that have had the biggest impact on him. We sat down with the young collector to learn more about his favorite watches, including those he’s inherited and those he’d like to pick up in the future, as well as his passion for Gerald Genta, one of the industry’s greatest designers. You’ve amassed quite the collection at 23, but two brands seem to stand out: Audemars Piguet and Patek Philippe. Is it correct to assume those are your favorite brands? Absolutely. Those are the pieces that I use on a daily basis. Some of them were my father’s. Audemars Piguet is especially important because my father loved it. I actually have a baby photo of me in the delivery room, being held by my father who is dressed in a beautiful brown suit with a gorgeous gold Audemars Piguet Royal Oak. I don’t know what happened to it, but I have the same watch in stainless steel today. The brand launched the Royal Oak over 40 years ago and its style hasn’t changed much over the years. You can wear a Royal Oak with a suit, and you can wear one casually. I don’t think I’ll ever get tired of that design. Because the previous Royal Oak disappeared, are you already thinking about holding onto this one for your future son? Yes, that’d be very nice! This next one is the Royal Oak Off-Shore in rose gold. That’s the one I wear the most out of all of my watches, and once again it has that classic Audemars Piguet style. The color combination is beautiful. If you see me, nine times out of ten, you’re going to see me wearing this one. 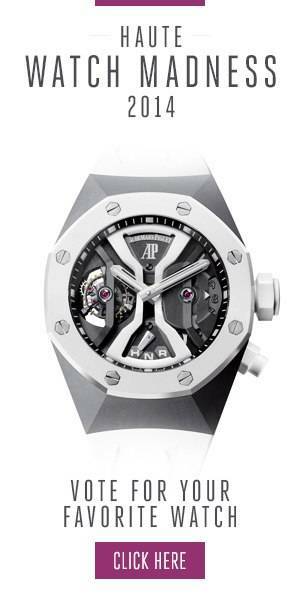 As you’ve mentioned, this is a “classic” Audemars Piguet. But you also have an interest in high jewelry pieces, don’t you? Nicolas Bijan wearing his father’s Audemars Piguet Royal Oak Offshore with pavé diamonds and matching cuff links. Yes, and this high jewelry Royal Oak is a gorgeous example. I wear it to black tie events. I can confidently say it’s my favorite watch in the whole collection because it was my father’s. My father wore this every day. It was given to me just as I was about to start university. This one holds a lot of sentimental value. My father was such a big figure and had so much charisma that he could wear a watch like this everyday. I actually have cuff links that match, with pavé diamonds and my initials. That was something my dad also had. I’d say that my biggest style icon would be my father. You also own two Patek Philippe watches. I love how Patek Philippe has this saying that, “you never actually own a Patek Philippe; you merely look after it for the next generation.” These watches are really great investments. They appreciate in value, which is rare for watches that you can wear daily. I have this Ref. 5159. It’s a beautiful piece. This one is yellow gold, and it opens up in the back so you can see the movement. It has the perpetual calendar, the moon phase, and the leap year. I wear a suit every day and it’s nice to have this watch as an accessory. And for your second piece, you’ve chosen the World Timer. Can you tell us why this model makes you tick? The reason I love Patek Philippe so much is that it makes watches that are really amazing accessories to a suit. The bracelet on this particular watch is really a piece of art. It’s a formal watch as well, but sometimes you see people wearing it casually. Another watch I like that Gerald Genta designed was the Patek Philippe Nautilus. That’s a watch that I’d really like to get. It would appear you really like that designer. Patek Philippe World Timer, Audemars Piguet Royal Oak Offshore in rose gold, Patek Philippe Ref. 5159, Audemars Piguet Royal Oak Offshore Triple Date, and Audemars Piguet Royal Oak Offshore with pavé diamonds. I’m a huge fan of Gerald Genta. Even his work with Bulgari was very cool. He was innovative, forward-thinking, and understood quality, exclusivity, and price points. And those are all of the things that we think of at Bijan. When Gerald Genta designed the first Royal Oak watch, it was innovative and sporty. But I think what made Gerald Genta so successful was the test of time. Pieces like that you have to have respect for not only from a design standpoint, but also from a collector’s standpoint. Outside Audemars Piguet and Patek Philippe, what are some of the others brands that you keep an eye on? I think watchmaking is really an art, and there are a couple of brands that I admire aside from Audemars Piguet and Patek Philippe. Greubel Forsey is amazing; it makes incredible machines. Breguet is also an amazing brand. It has a lot of history and the pieces that it makes are gorgeous. But I’ll always have special affection for Audemars Piguet and Patek Philippe. I have a lot of respect for brands like Audemars Piguet and Patek Philippe because they have a similar philosophy. It’s an honor to wear them. One day I’ll be able to pass them down to my son, or my grandchildren. Anything that you can pass through the generations is amazing. That commitment to excellence is very important. Audemars Piguet, Patek Philippe, Greubel Forsey, and Breguet are all brands that share a philosophy similar to Bijan’s, and I have a lot of respect for them.